Call me a romantic, but there is something downright charming about a beautiful Christmas wedding. Between the twinkling lights and fresh white snow, which you are guaranteed to have in South Dakota, everything seems to glitter a little more this time of year. The color options for holiday weddings are truly endless from silver, white and turquoise to black and golds, yet red still remains to be one of the most popular choices. 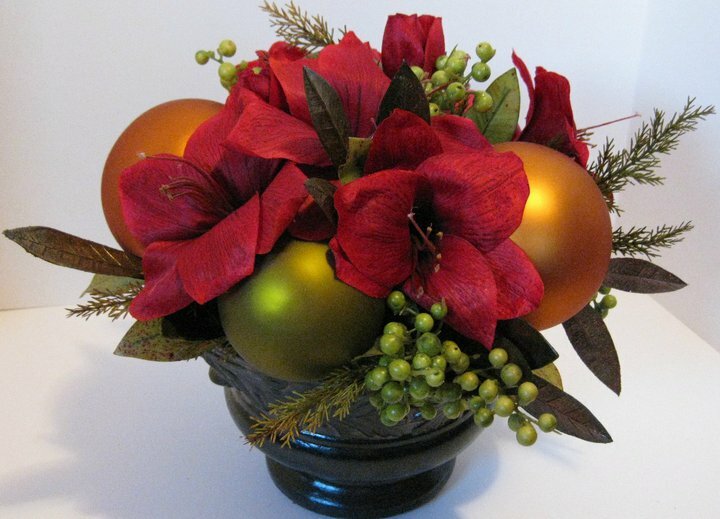 Another great thing about a Christmas affair, is you are able to incorporate unique elements special to this time of year. Consider incorporating Christmas ornaments into your centerpieces or decorated trees at the ceremony and reception. Ribbon is also a great element that seems to gain more of the recognition it deserves during the holidays. I will be busy this weekend with a fabulous wedding and I hope to have some pictures of it up soon. Have a great weekend all! Posted in Holiday, Wedding Flowers and tagged christmas weddings, holiday weddings, sioux falls wedding florist, sioux falls wedding flowers, sioux falls weddings, south dakota wedding florist, south dakota wedding flowers, south dakota weddings, wedding centerpieces, wedding flowers. Silk Show Friday & Saturday!